Criteria Labs CL-1210 is a space qualified power GaN amplifier that can operate from 27 to 31 GHz, achieves 36.5 dBm saturated output power, with a power-added efficiency of 25% and 25dB of small signal gain. 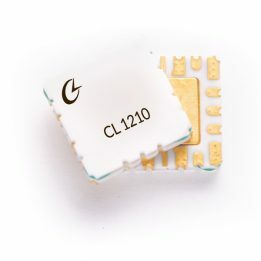 The CL-1210 is offered in a hermetically sealed 22-lead 7×7 mm ceramic QFN designed for surface mount to a printed circuit board. The package has a Cu base, offering superior thermal management. The CL-1210 is suited to support military and space applications. This part is specifically fabricated to pass stringent PIND and RGA testing as part of Military screening and QCI tests. Both RF ports have integrated DC blocking capacitors and are fully matched to 50 ohms.